C&T Courier | Quality and reliability at its best. C&T Courier’s suite of high-tech, chain-of-custody tracking tools is designed to help you stay connected to your operations – every step of the way. 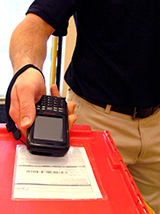 We use state-of-the-art voice and data communications – including barcode scanning, signature capture, and GPS satellite systems to monitor and analyze routes – ensuring that you’ll always have real-time information about your critical deliveries. We also partner with Integra DeliveryTrack software to streamline pharmacy back office paperwork and compliance. Our qualified Operations Control Center staff monitors all of your routes deliveries, and shipments in real time, anticipating and identifying any possible delays in en route. And in the event of an unavoidable delay, we work proactively to make you aware of it while providing an alternative solution, ensuring that your critical deliveries are never at risk.